For my first foray into following a pattern, my requirements were simple – a basic skirt which resembled anything other than a pencil. Because anyone who knows me well, knows my aversion for the pencil skirt. 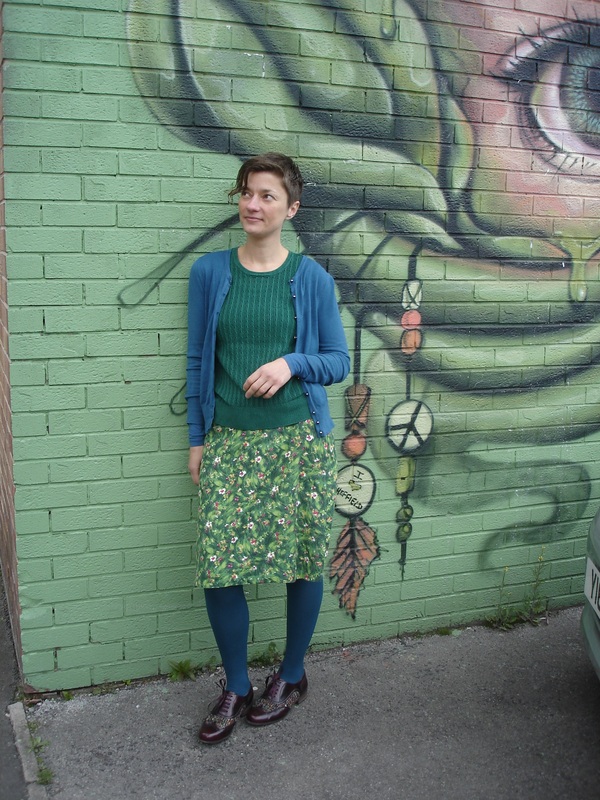 So, where better to start than the A-line skirt featured on the Great British Sewing Bee. The first challenge was to work out how my measurements translated to the pattern measurement chart. As I span three sizes, this was never going to be simple and cutting to a pattern size 16 proved far too generous. After a number of toiles, I realised I was either going to have to become adept at adjusting patterns to fit my non-standard frame or skill up in pattern drafting. This skirt was an ideal first project, with the opportunity to try out the basic skills I had acquired at college: darts, a faced waistband and a semi-concealed zip. Whilst I’m pleased with a wearable first make, its shape is nowhere near flared enough for me. My idea of A-line veers more towards an inverted W and sent me burrowing down a rabbit hole of patterns designed for the pear-shaped frame. I reckon Sewaholic’s Hollyburn Skirt has my name written all over it. Incidentally, I have been re-visiting the seminal TV series Twin Peaks, in light of a proposed sequel. And I have to concede that Sherilyn Fenn rocks a pencil skirt like no other. So, maybe the issue isn’t with the design … just its incompatibility with my body shape. I take it back pencil – it’s not you, it’s me.